For the first time, trek into the wild backcountry of America's first national park and see what it looks like from a bear's point of view. 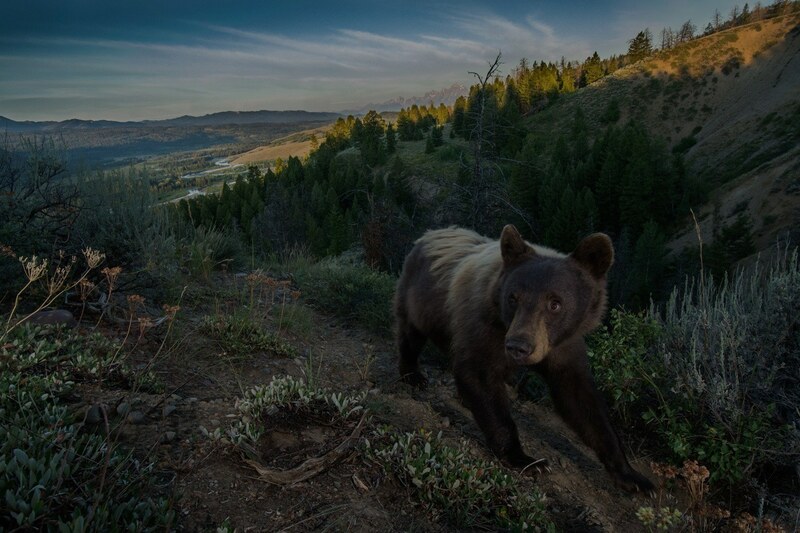 Special cameras were attached to the tracking collars of two grizzlies and two black bears in Yellowstone. Massive and hungry, these bears prowl for food and confront danger along the way. It's a matter of life and death for all of them. Tag along as National Geographic gives you an unprecedented window into some of the most fearsome predators on Earth. And watch as these bears act as tour guides through their secret world, with little human intervention. Like grizzlies, black bears are opportunistic omnivores, meaning their diets consist of both meat and plants. For years, there have been reports of a cannibalistic black bear roaming the mountainous foothills around Yellowstone Park headquarters at Mammoth Hot Springs. Could bear 22517—an 8-to-12-year-old weighing 260 pounds—be that bruin? Shortly after being outfitted with a camera, this bear, wearing a coat the color of a dark chocolate bar, offers tantalizing clues. "Each piece of film footage is really like watching a cliffhanging," bear researcher Nate Bowersock says. "You don't know what's going to happen next, and it all leads to a pretty dramatic finish." Bears rely on different types of habitats for a variety of food sources. Berries supply them with food rich in sugar that converts to much needed fat for the winter. In these three video clips taken an hour apart, the bear travels over a variety of terrains, climbing slopes and ending up on a snow patch. The bear digs around a food storage area used by red squirrels and finds some white bark pine cone to chew on. The bear splashes his way through a creek bottom, cutting through the backyards of suburban homes outside of West Yellowstone, Montana. There are occasions where bears eat other bears. It turns out this bear is a cannibal. In twilight, the bear comes face-to-face with a pack of wolves. Standing his ground, his posture tells the lobos he isn't a potential foe to mess with, and no battle ensues. Think of this black bear as a late teenager in bear years. He's a young adult, wild and free, who awoke from hibernation alone in his own den. Now, he's spending his first full summer having to fend for himself, getting by without the protective care of mama at his side serving up free meals and keeping him out of trouble. Is he ready? Bear 22519 is three years old, weighing only 103 pounds. He's nicknamed "the Tower Black Bear" because of the region of Yellowstone he inhabits. He has no idea what dangers await him. In his first full summer on his own, this youthful bear eats his way through hills near Tower Creek. You'll notice that he pauses at one point when he looks through the trees and spots human onlookers. Later, the bear disappears into the forest and angles southward toward Yellowstone's center. He's on the run, probably trying to avoid danger. His short, sharp claws help him quickly climb to safety on a tree. He fords Nez Perce creek and journeys into Hayden Valley. Bears can socialize with one another. Here, while cresting a hill, he seems to enjoy the company of another teenage bruin, perhaps a relative. But bears don't always get along with one another. When confronted by a larger competitor here, he slowly walks backward before going into a full-fledged run. Grizzlies inhabit huge home ranges. Hulking males like this grizzly, which tips the scales at 578 pounds, wander across a territory that would cover a large swath of any U.S. city. Here in the rough-and-tumble wilderness of Yellowstone, his greatest worry is having to fend off another grizzly who might be even bigger than he is. At 18 or 19 years old, bear 394 has obviously prevailed in previous battles with competitors. Biologists who outfitted him with a bear cam noted his teeth are slightly worn down from gnawing on the flesh and bones of his prey. "He's a big male grizzly nobody wants to mess with," says Yellowstone bear researcher Nate Bowersock. Here's a glimpse at a typical day for a grizzly—digging roots, feeding on a bison carcass, and walking across a meadow. A bear isn't motivated only by finding food. Here he takes a bath in a pond. White bark pine seeds are a highly nutritious staple for grizzlies that put on weight before retreating to their dens. 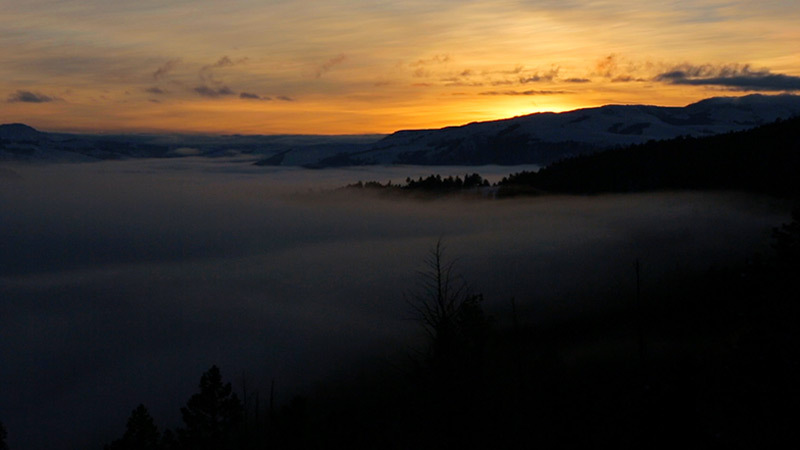 The autumn mists will turn soon to snow in the Yellowstone high country. But not before the bear prowls the perimeter of his home range. A bear lumbering through Hayden Valley, aka "the valley of grizzlies," must be alert to big bear rivals. And hikers must be alert to the danger of running into bears. Long in the tooth, this grizzly is a 475—pound, 24—year—old male—considered ancient in the life of a Yellowstone bear. And he was the first to be fitted with a bear cam. We can only speculate how he once lorded over northern regions of the national park during his reign as a formidable solitary monarch, when he was still in his prime. Now bear 228 is trying to hang on, and he lumbers right into the backyards of homes. 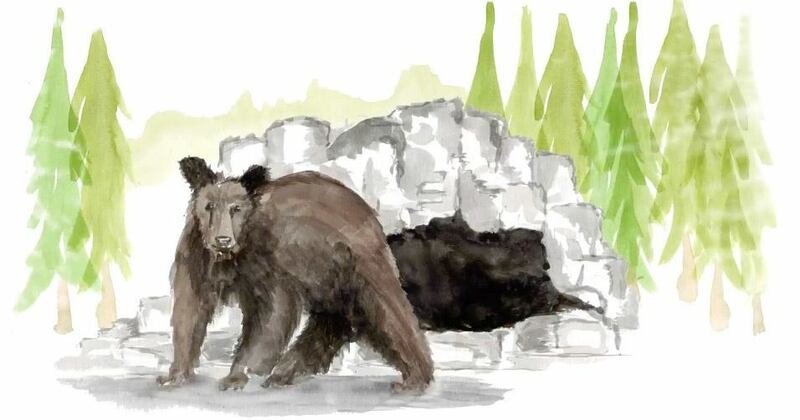 Ironically, bear experts like Kerry Gunther say it is these kinds of discreet, un-menacing bruins—tolerant and adroit in navigating "people spaces"—that experts say will shape the future survival of Greater Yellowstone's bear population. The onset of fewer daylight hours and colder temperatures tells a bruin to hurry and eat as much as possible. That's how bears bulk up to survive months of winter hibernation. The bear uses a towering pine as a scratching post and a place to leave a scent, signaling to other bears this is his territory. People are never far away along the Upper Yellowstone River Basin. Here the bear discreetly navigates a gauntlet unnoticed, stopping for a drink in a rushing creek. 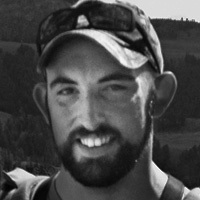 Within days this grizzly will leave behind nothing but bones from a bison carcass. He's in what's known as the boneyard. This project was designed by experts at Yellowstone National Park who wanted to know more about the eating habits and habitat use of bears. The camera collars gave biologists a bear's-eye perspective they didn't have before, 20 seconds at a time. The videos will also give them a basis of comparison to see how bears might shift their diet as the climate changes. Next up—a longer, more extensive use of collar cameras involving more bears. Design and Development: Hello Monday. Top photograph by Charlie Hamilton James, from Grand Teton in the Greater Yellowstone Ecosystem. 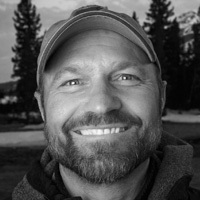 Photograph of Kerry Gunther by Ronan Donovan, photograph of Nate Bowersock by NPS Photo. Text: Todd Wilkinson. Editors: Janey Adams, Jeffrey Katz, Ryan Morris, Shannon Sanders. Video: Ronan Donovan. Audio: Justin O'Neill.